Between demanding careers and demanding families, Moms are constantly on the go and juggling multiple responsibilities. One of those responsibilities includes purchasing goods for their families. With the annual U.S. mom buying power estimated to be $2.1 trillion, brands are looking to capture their attention and own the marketing of “Mom”. 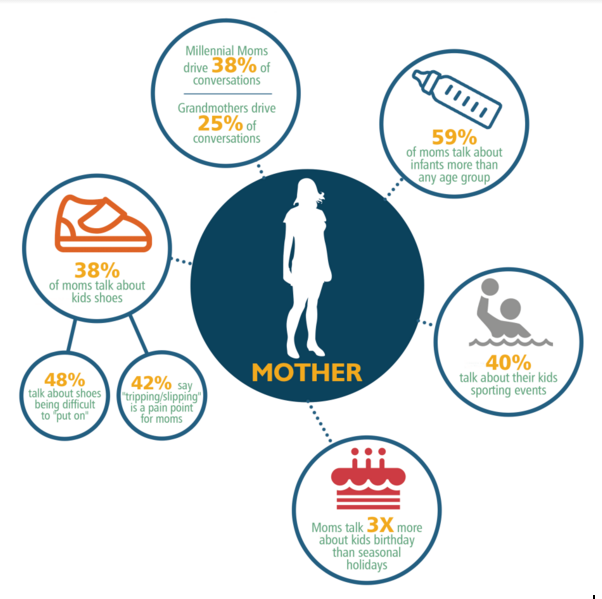 Many moms, however, feel pigeonholed by brands and that most marketing towards them is patronizing, according to FanFinder survey (March 2015). Brands must learn to market towards moms with relatable content that is empathetic and understanding. With 90% of moms online and 22% shopping online at least once a day, more moms are having conversations through social channels about their purchases and sharing their feelings about their experiences with brands. 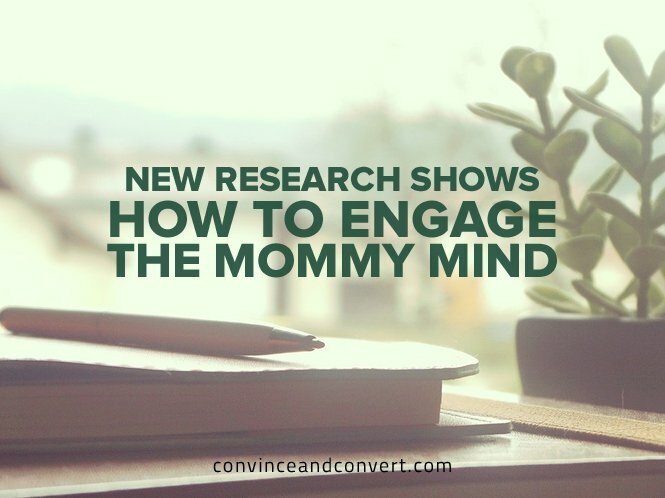 If brands could harness that data around moms, they’d be better equipped to market to them, learning what campaigns are causing negative sentiment and what potential initiatives they could take. In order to determine the topics moms discussed most on social, Insightpool’s data science team did a deep dive into the mom by creating filters around “children” and “kids”. After collecting over 600k social interactions, Insightpool saw that the majority of mom conversations surrounded their kids’ shoes and sporting events, as well as several other topics. With insight into key target audiences, brands now have exclusive access into who they should target and the topics their communities care about. Many brands stop at the data but aren’t sure what’s next. Now, brands can take the key findings and implement them into marketing strategies. Characteristic marketing allows brands to get to know their prospects before engaging in a conversation. In essence, this means that marketing can now support and encourage sales teams to become smarter sellers, so that there’s no need to go into a sale blind. Social data is now accessible to brands, but to say that there’s a vast amount of helpful human data out there is an understatement. With this data overload, brands have the ability to pull key characteristics, sentiment, topics, and conversations from social data. This gives marketers direct access to their prospects, customers, and buyers behaviors. Using a tool like Insightpool’s proprietary algorithm, you can gain direct access to social data and pull key finding about customer and prospect characteristics. While we can’t foresee the future just yet, we are getting closer—at least on the marketing level. Characteristic data can help brands become predictive in their efforts so that marketing will not only help sales, but will also help stakeholders with business decisions based on data insights. This shift to predictive analytics has been brought on by technology, but also by a shift in thought from aggregate analysis to individual treatment, and from universal insights to personal insights. Social data gives brands more in-depth insight into the voice and feeling of the consumer. This insight helps brands understand purchase intent, if someone is excited about a product or topic of interest. This type of insight can help brands think more predictive about product launches, marketing plans, and overall business strategy. Marketers have always had to deliver when it comes to ROI, but insights give marketers different ways to assess success. With characteristic marketing, there are new ways to measure value. The value of the market’s organization, the value of particular projects, and the importance of market insights’ deliverables in winning deals, making decisions, and supporting stakeholders’ projects are all of the ways that brands can measure on a non-quantitative basis. Essentially, when marketers discover where insights fall in line with business objectives and how they fit into the overall business, that is value added. The shift from demographic marketing to characteristic marketing represents the vast possibilities that data provides for brands and businesses. Emerging technologies combined with new thought processes are paving the way for a more meaningful, insightful and successful approach to consumer marketing. From actionable marketing initiatives to predictive efforts, the opportunity is there—you just have to take it.